CIA Director Leon Panetta, selected as defense chief, has experience with a GOP Congress, an analyst says. Washington (CNN) -- In the most extensive reshaping of the Obama administration's national security team to date, the president will name Central Intelligence Agency Director Leon Panetta as his nominee to succeed Robert Gates as defense secretary, top U.S. officials said Wednesday. Gen. David Petraeus will be nominated to take over as CIA director, and Lt. Gen. John Allen will succeed Petraeus as head of the U.S-led international military force in Afghanistan, a senior administration official told reporters. In addition, longtime diplomat Ryan Crocker will be nominated as the next U.S. ambassador to Afghanistan, the official said. President Barack Obama will formally announce the changes on Thursday, according to the senior administration official. It is the biggest reshaping of Obama's national security team since he took office in January 2009 and reflects a longstanding plan by Gates to step aside this year. More changes also are coming. Both Adm. Mike Mullen, chairman of the Joint Chiefs of Staff, and FBI Director Robert Mueller are not eligible for renomination for terms that expire this year. Gates will resign effective June 30, assuming Panetta gets confirmed by Congress in time and is ready to start on July 1, according to an administration official and a congressional aide familiar with phone calls Gates was making to legislators and senior staff members. Petraeus will remain in command in Afghanistan until Allen is ready to take over at the beginning of September, officials said, which could require an interim CIA director if Panetta moves to the defense secretary's office as planned on July 1. In addition, Petraeus will resign from the military once confirmed so that he serves as a civilian CIA director, officials said. Initial reaction from Congress was positive, with key legislators on intelligence and security issues praising both Panetta and Petraeus as good choices. "The sum total of these picks is that the president has chosen experienced people with unique capabilities to serve our nation at a dangerous time," said Republican Sen. Lindsey Graham of South Carolina. "This team will provide the leadership to help make our nation safer. I could not be more pleased with these selections. I hope these nominees receive swift approval by the United States Senate." Gates was telling legislators and staff members that he recommended Panetta for his job six months ago, and joked that Panetta stopped speaking to him for days for doing so, the officials said. In addition, Gates was saying that Allen was a consensus choice to succeed Petraeus, according to the officials. It took a meeting with Obama to convince Panetta to accept the job, a source familiar with the discussions told CNN. Panetta has been happy serving at the CIA, but "believes strongly in public service and answering the call from the commander-in-chief," the source said. 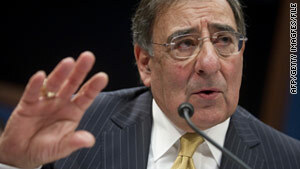 Panetta, 72, took over at the CIA in February 2009. He served as chief of staff to President Bill Clinton between 1994 and 1997, and was previously the director of the Office of Management and Budget (OMB). The California Democrat served in the House of Representatives from 1977 to 1993. Before coming to the CIA, he spent 10 years co-directing a public policy institute with his wife, Sylvia. He was brought in as a relative outsider, without hands-on intelligence experience, to manage an agency that had been shaken by the exposure and criticism of its controversial interrogation and detention program. Panetta's longstanding ties to Congress were seen as a way to restore the administration's relationship with oversight committees. He has been given high marks on both fronts from inside the agency and in Congress. David Berteau, a senior adviser at the Center for Strategic and International Studies, said Panetta brings several important qualities to the table. He "learned a lot of lessons" about defense budgeting during his stint as the head of the OMB, and knows how to deal with a Republican Congress, as he did during the Clinton administration, Berteau said. Panetta's former congressional district in northern California had a huge defense presence, Berteau said. Panetta has earned the trust and confidence of Obama as leader of the CIA, and has name recognition, which is important, Berteau said, adding: "It's a name Americans recognize. Filling Bob Gates' shoes is really going to be a tough job." Berteau said the president's choice of Petraeus to lead the CIA indicates that Obama is interested in his national security views and efforts and it "indicates that the president cares about the way all those pieces fit together." Earlier this month, Petraeus took a highly unusual step for a military officer when he publicly acknowledged the possibility of being in contention for a presidential appointment. "It's probably not appropriate for me to comment on whatever might be considered down the road," he told reporters in Kabul when asked about the possible CIA nomination. "I've had discussions, but again, it wouldn't be appropriate to comment." Petraeus, 58, assumed command of the NATO International Security Assistance Force (ISAF) and U.S. Forces Afghanistan on July 4, 2010, after serving for more than 20 months as commander of United States Central Command. He previously commanded multi-national forces in Iraq, leading the so-called "surge." During his time commanding the U.S. Army Combined Arms Center and Fort Leavenworth, he oversaw the development of the Army/Marine Corps Counterinsurgency Manual. Crocker has served previously as U.S. ambassador to Iraq and to Pakistan, while Allen became deputy commander of U.S. Central Command in July 2008. Gates is the only Cabinet member from the previous administration to stay on when Obama came into office. 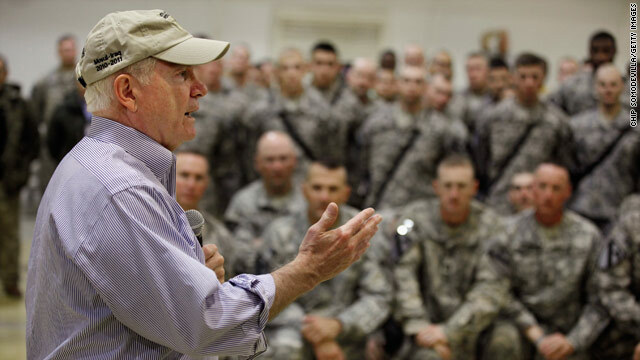 President George W. Bush nominated Gates as the nation's 22nd secretary of defense in December 2006 to replace Donald Rumsfeld, one of the architects of the Iraq War who was facing widespread criticism. Gates did not expect to stay on after Bush's presidency ended. When asked if he would continue under another administration, Gates said in 2008, "I learned a long time ago never to say never, so my answer is: The circumstances under which I would do that are inconceivable to me." But those circumstances arose. In December 2008, then-President-elect Obama expressed a desire for continuity at the Pentagon, given the ongoing conflicts abroad in Iraq and Afghanistan. "I spent a long time hoping the question would never be popped," Gates admitted the day after Obama announced his nomination. But, he said, Obama "impressed" him. It is unclear who may replace Mueller at the FBI. Attorney General Eric Holder on Tuesday did not rule out Mueller staying on short-term when his 10-year term expires in September if a successor has not yet been confirmed. Mueller will leave "hard shoes to fill," Holder said. Holder said he has been discussing potential nominees with White House officials, including Vice President Joe Biden. Holder said he believes that if a nominee is selected by May, the administration should have time to get the new director confirmed by August. If that timeline slips, however, the Mueller term would end September 4, one week before the 10th anniversary of the 9/11 terrorist attacks on the World Trade Center and the Pentagon. Mueller has often remarked that he barely had a chance to find his desk before the 9/11 attacks occurred, and his entire decade was dominated by the fight against al Qaeda and its scattered supporters at home and abroad. CNN's Barbara Starr, Joe Sterling, Terry Frieden, Tom Cohen, John King and Chris Lawrence contributed to this report.